island of Java--split off from the USS Whipple and the tanker Pecos and was never seen again by Allied forces. Despite the later discovery of bodies identified as Edsall crewmembers near a remote airfield on the coast of Celebes, what happened to the ship remains a matter of mystery and, perhaps, deliberate obfuscation. 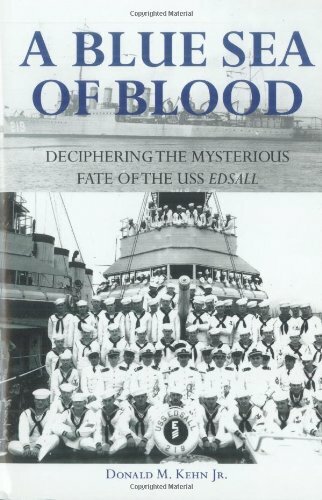 This book explores the many puzzling facets of the Edsallâ€™s disappearance in order to finally tell the full story of the fate of the vessel and her crew. Based on exhaustive research of the historical record--including newly deciphered Japanese documents and previously unrevealed material from the crewâ€™s family members--Upon a Blue Sea of Blood offers a painstaking reconstruction of the shipâ€™s history. The book investigates not only the Edsallâ€™s mysterious final action, but also her wide-ranging pre-war career and the curious uses to which her story was put--generally under false pretenses--first by the pre-war U.S. Navy and then by the Japanese wartime propaganda machine. And finally, military historian Donald Kehn considers the circumstances surrounding the curious obscurity of the Edsallâ€™s heroic service and final battle in American histories. Redressing six decades of official indifference, Kehnâ€™s account recovers a significant chapter missing from the history of World War II--and tells a long-overdue story of courage and tragic loss.